This is the bike that invented the concept of the modern touring motorcycle. And reinvented it. And just last year, reinvented it all over again. The latest generation of Gold Wings are leaner, more refined, more up to date than ever. From their super smooth six-cylinder engines to their available 7-speed DCT automatic transmissions. From their revolutionary front suspension systems to tech features like Apple CarPlay™. Lighter, leaner, and designed to push the limits of what a touring bike can be, the 2019 Honda Gold Wing will expand your adventures beyond imagination. Inspire yourself. ELECTRIC WINDSCREEN: You’ll notice a couple of things about the Gold Wing’s windscreen. First, it’s electrically controlled, moving both up and down over an 4.9 in. range for the Gold Wing Tour (4.1 in. for the Gold Wing) as well as changing its angle as it raises and lowers. Plus, it automatically remembers the last setting. Because you sit closer to the windscreen, it has a narrower, lower, more sporting profile, yet still offers excellent protection. FAIRING: Back in the 1980s, the Gold Wing was the first bike to introduce full-coverage fairings as original equipment, and this one is one of our best. It offers excellent wind and weather protection, yet is trimmer and more aerodynamic than our previous models. It also flows more air through ducting, helping keep you cooler on hot summer days. RIDER / PASSENGER LOCATION: The shorter engine and front suspension let us move the rider farther forward, enhancing the bike’s handling and making you feel more connected to the motorcycle’s steering axis. RIDER / PASSENGER SEATING: The seats use a material that makes it easier to move around, and the front portion of the rider’s seat is narrower, making it easier to reach the ground. The rider can enjoy an optional backrest, and on our Gold Wing models without a trunk, there’s also an optional backrest for the passenger. HUMAN MACHINE INTERFACE (HMI): Ever have to scroll through some abstract menu to access a feature on your electronic device? You’ll find plenty of simple, dedicated switches and controls on your Gold Wing’s handlebars, ergonomically placed, which give you simple, intuitive control inputs that zero out frustration. There is also a centralized control knob in the console similar to modern autos. LUGGAGE: All Gold Wings feature integrated saddlebags, designed to hold enough for most weekend trips. The bags open electronically with the push of a button, and lock and unlock remotely with the smart key. They’re hydraulically damped for smooth operation, too. FUNCTIONAL STYLING: Sometimes less is more, at least when it comes to motorcycles. 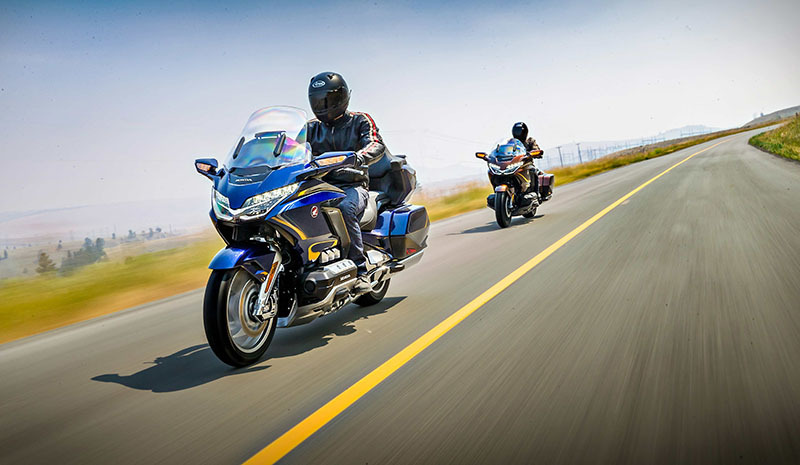 We’ve noted that the Gold Wing is lighter, more responsive, more athletic. That goes for its styling as well. While the bodywork still offers excellent weather protection, it’s crisper now, exposing a little more of the engine and chassis. It’s definitely not your grandfather’s touring bike. HEATED GRIPS: Part of riding a bike is enjoying the elements. But nobody likes being cold. That’s why every 2018 Gold Wing comes equipped with electric grips as standard equipment. TIRE PRESSURE MONITORING SYSTEM (TPMS): Correct tire inflation is a necessity for safe, economical motorcycling. And it’s especially critical with a touring bike, because of the varying loads. The Tire Pressure Monitoring System (TPMS) automatically warns you of low tire pressure on all Gold Wing models, including a readout of the actual front and rear pressure in PSI is a premium touch. ADVANCED METERS: The Gold Wing’s cockpit meters are information central. In addition to the basics like vehicle and engine speed, loading configuration, ride mode, fuel level, engine temperature and dual tripmeters, you can also monitor outside air temperature, cruise control speed, heater levels and even selected apps linked through CarPlay® on an Apple® iPhone®. APPLE CARPLAY INTEGRATION: A first for the motorcycle industry! Apple CarPlayTM seamlessly integrates your iPhone® into your Gold Wing. That means you can use your iPhone to access Apple Maps®, Apple Music®, and other services easily. You’ll have access to weather, playlists and telephone numbers while aboard. Available Bluetooth®-enabled wireless headsets let you communicate more easily than ever. And best of all, with more apps available every day, CarPlay® keeps your bike’s technology and convenience on the cutting edge. NAVI: Every Gold Wing and Gold Wing Tour are equipped with a big, bright, seven-inch full-color TFT LCD screen to display routes and other navigation information. Plus, since it’s now equipped with a gyrocompass, the system even functions inside a tunnel. Independent of the Apple CarPlay™ feature, it works with or without your phone. Added bonus only by Honda: 10 years of free map updates! 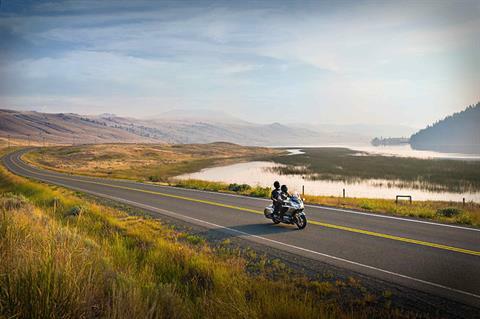 VEHICLE SETTINGS: Your Gold Wing is packed with smart rider aids. A glance at the dash keeps you informed of things like ride mode (Tour, Sport, Rain, Econ), rear suspension preload settings (solo, with passenger, loaded, unloaded on Tour models), tire pressure and much more. AUDIO: Your Gold Wing’s audio system is an excellent example of state-of-the-art electronic technology. In addition to listening to music, with an available Bluetooth headset you can make or answer phone calls without taking off your helmet. In addition to a standard USB connector, options include a separate passenger audio control switch, a high-output amplifier and speakers, Sirius XM® satellite radio, a CB radio, and more. THROTTLE BY WIRE: The Gold Wing’s throttle-by-wire system enables features like our ride modes and our exclusive Honda Selectable Torque Control (HSTC) which you’ll find on our Gold Wing Tour models. HILL START ASSIST: Both the Gold Wing and Gold Wing Tour models feature Hill Start Assist (HSA). 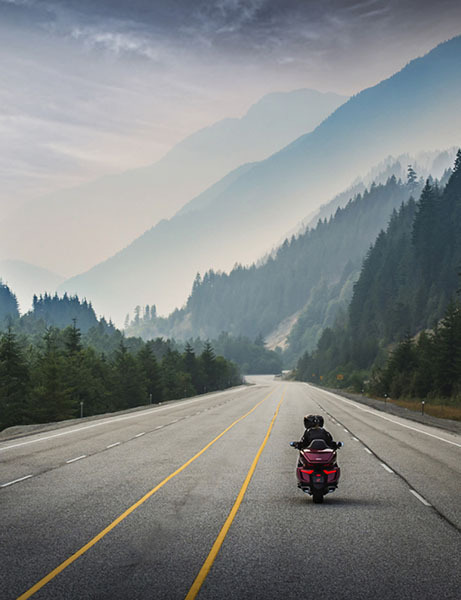 This feature momentarily holds your motorcycle’s position on inclines when the brakes are released and before you apply the throttle, eliminating any roll-back drama. It’s a great convenience when starting from a stop on a hill. 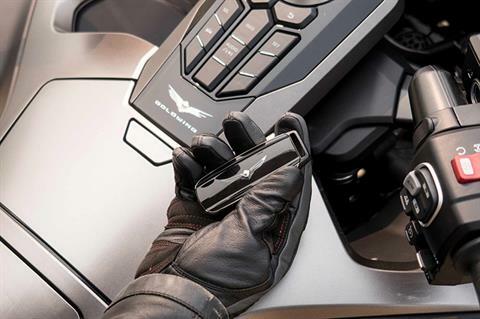 SMART KEY: Your Gold Wing features an electronic smart key. When the key is in close proximity (say, in your jacket pocket), you can just hop on, press a button, and ride off. An “answer back” feature lets you find your bike in the dark or in crowded rally parking. ISG (INTEGRATED STARTER GENERATOR): Most cars and motorcycles have separate starters and alternators. Not your Gold Wing. We’ve combined the starter and alternator into one compact assembly, that is both light and compact. It’s part of the Gold Wing’s overall weight-savings program, and you’ll hear the difference the first time you press the start button. REVERSE: Gold Wing DCT models offer an exclusive low-speed reverse that uses engine power. The Gold Wing Tour with manual transmission offers a unique electric reverse. Both systems make it easy to maneuver your bike out of a parking space, especially if you need to roll back up hill. LED LIGHTING: All 2018 Gold Wing models feature a complete LED lighting package. The headlights, the taillights, and every bit of instrumentation is LED. LEDs not only last longer, but they’re are also lighter and run cooler. NANO-TECH PAINT: Even the Gold Wing’s paint is high tech, using BASF’s nano technology. The darks look darker, and the lights look brighter. The paint itself has a luxurious wet look. The Gold Wing is available in three colors (Candy Ardent Red, Pearl Stallion Brown, and Matte Majestic Silver). TURN SIGNALS: You’ll notice that the Gold Wing’s front turn signals are integrated into the rearview mirrors, and use three LEDs each. The rear LED turn signals are built into the tail- and brake-light assembly for a clean, integrated look. Best of all, they’re self-cancelling. 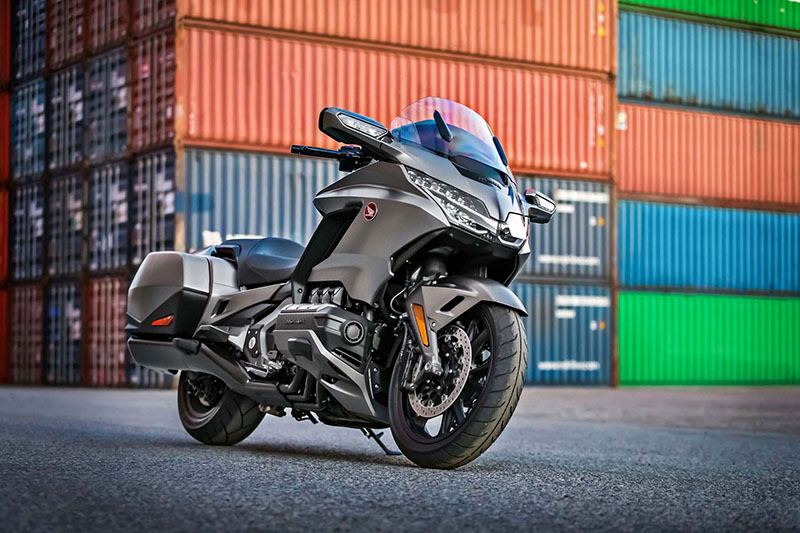 DOUBLE WISHBONE FRONT SUSPENSION: One look and your eyes will immediately go to the Gold Wing’s radical, Honda-engineered double-wishbone front suspension. The innovative design changes the path the wheel travels through the suspension stroke, and that lets us move both the engine and the rider/passenger closer to the front wheel. You get more room, and stellar handling. FRAME: This latest generation all-aluminum frame is significantly lighter and more compact than previous editions. State-of-the-art die-casting lets us fine-tune chassis rigidity, giving you both a smooth ride and precise handling. SWING ARM / REAR SUSPENSION: Using our proprietary single-sided Pro Arm® design, the aluminum swingarm still houses the Gold Wing’s shaft drive. The swingarm links to the frame using a patented pivot structure that both increases stiffness and reduces weight. You get responsive handling and a smoother ride. ANTI-LOCK BRAKES: Have to make a hard stop, fully loaded and two up? All 2018 Gold Wings are equipped with combined anti-lock brakes for excellent stopping power under a wide variety of road and traction conditions. RIDE MODES: Gold Wing engines offer a wide range of user-friendly power, and now you can even choose between four ride modes (Tour, Sport, Rain, and Econ). Each mode varies power output depending on the mode selected. WEIGHT REDUCTION: Shaving weight on a motorcycle returns all sorts of benefits, from handling to acceleration to just being easier to maneuver around. We didn’t just shave ounces or grams with the Gold Wing. We lopped off pounds—almost 90. The lighter weight absolutely redefines this motorcycle. You thought it was fun to ride on twisty roads before? Wait until you experience this one. LOW CENTER OF GRAVITY: It’s not just how much a motorcycle weighs; it’s how it distributes that weight. Thanks to their horizontally opposed engines, Gold Wings have always offered a low center of gravity. 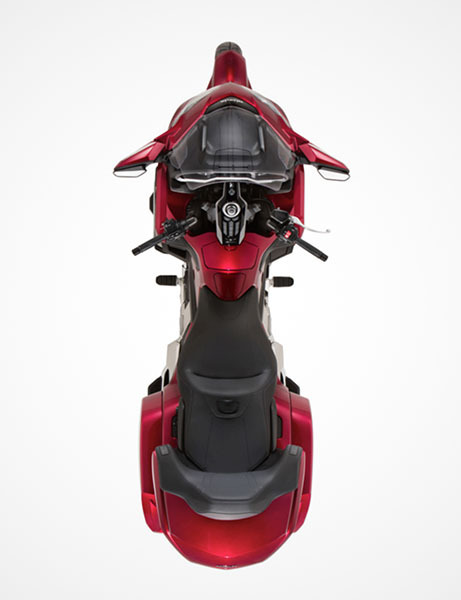 The 2018 Gold Wing offers the lowest center of gravity of any bike in the class. That’s a huge benefit in handling, and it makes the bike feel lighter and easier to maneuver. RADIAL FRONT BRAKE CALIPERS: The brake calipers on the Gold Wing are mounted similar to that of our Grand Prix winning RC213V. Why? The stiffer mounting reduces caliper flex and improves brake power and feel. 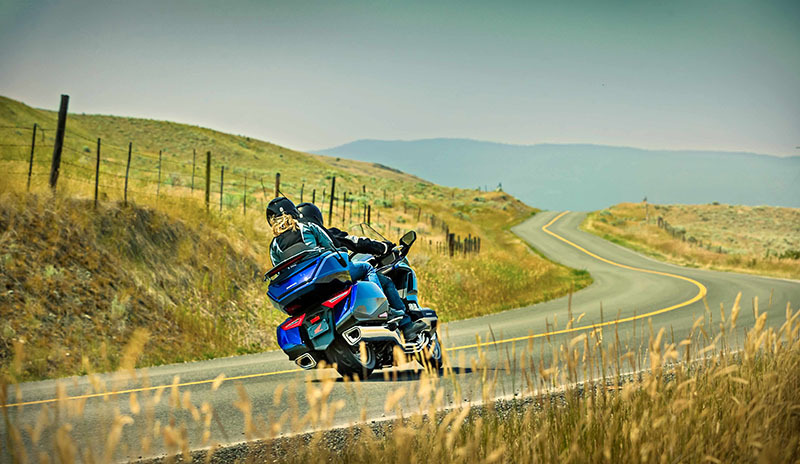 ELECTRONIC SUSPENSION PRELOAD: The Gold Wing Tour’s suspension features four electronically adjustable modes for varying loads. You can select (1) Rider, (2) Rider with loaded bags, (3) Rider and passenger, and (4) Rider and passenger with loaded bags. 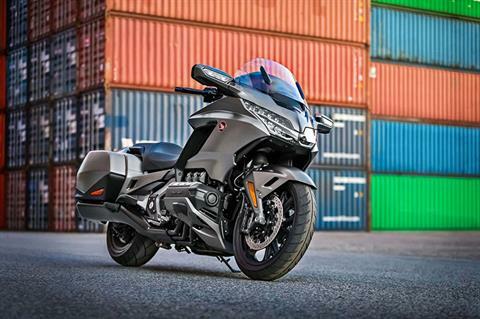 ENGINE: The Gold Wing’s horizontally opposed six-cylinder engine is famously smooth and powerful. We’ve kept that same overall architecture, but it’s an 1833 cc powerplant for 2018, and over 13 pounds lighter (more than 8 pounds for the DCT versions). ALUMINUM CYLINDER SLEEVES: High-strength aluminum cylinder sleeves help reduce weight, increase cooling efficiency, and reduce engine length. The 73 mm cylinder bore and short, high-strength crankshaft also help make the engine more compact. UNICAM CYLINDER HEAD DESIGN: The engine uses four-valve, Unicam® cylinder head design. That improves engine performance and power, and also contributes to the engine’s weight reduction. 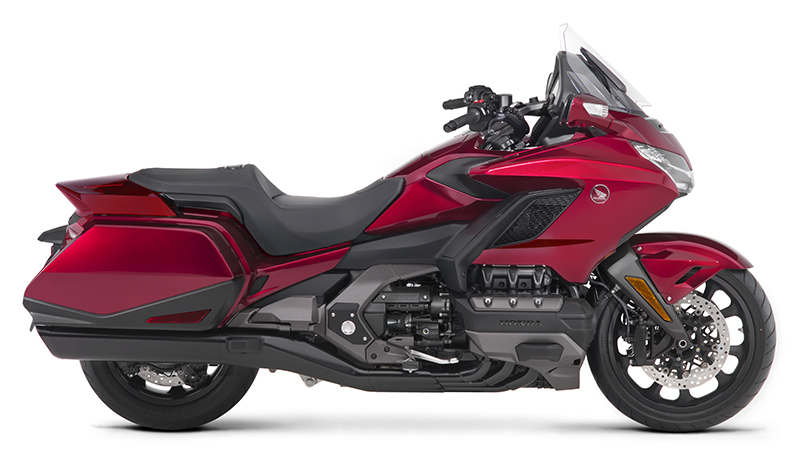 The four-valve per cylinder design is also a big part of the Gold Wing’s improved fuel efficiency. 7-SPEED AUTOMATIC DCT TRANSMISSION: This is huge news for 2018. 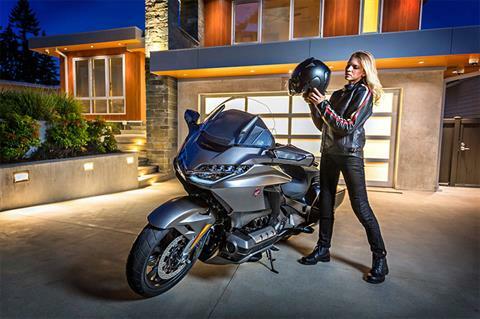 For the first time ever, the Gold Wing is available with a 7-Speed Automatic DCT. The shifts in this version are faster and smoother than ever, and the overdrive seventh gear is perfect for highway cruising. EXHAUST DOUBLE WALL PIPES: You may think this is just for cosmetics, but on a hot day single-wall exhaust pipes can throw off a lot of heat. 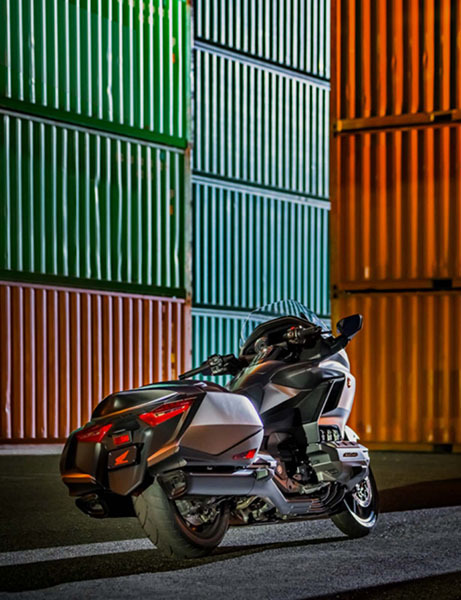 The Gold Wing’s twin-wall design keeps things cooler. Plus, this is the best sounding Gold Wing we’ve ever built! 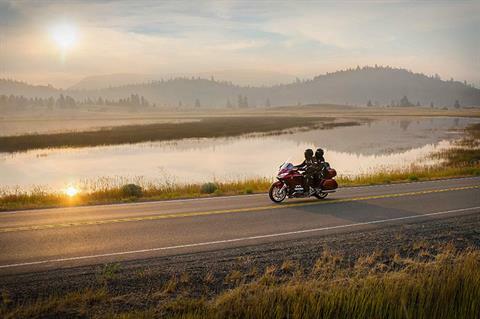 FUEL EFFICIENCY: Because the Gold Wing is lighter, you’d expect it to be more fuel efficient. But lighter weight is just the start. Combined with the engine, intake system, and four-valve design, estimated fuel economy is up 22 percent. Want to really squeeze the last mile out of every drop? Try the “Econ” ride mode setting. WALKING MODE: All Gold Wings with DCT transmissions feature “Walking Mode,” which lets you creep forward under power at a walking pace. Think how easy it will be to get in and out of tight parking spots with a fully loaded bike. CRUISE CONTROL: Of course the Gold Wing still features cruise control, and with our throttle-by-wire system it’s better than ever. Front - Double Wishbone Type; Travel - 4.3 in. Rear - Pro Arm® single-side swingarm with Pro-Link® single shock; Travel - 4.1 in. ALWAYS WEAR A HELMET, EYE PROTECTION AND PROTECTIVE CLOTHING. NEVER RIDE UNDER THE INFLUENCE OF DRUGS OR ALCOHOL, AND NEVER USE THE STREET AS A RACETRACK. OBEY THE LAW AND READ THE OWNER’S MANUAL THOROUGHLY. For rider training information or to locate a rider training course near you, call the Motorcycle Safety Foundation at 800-446-9227. Gold Wing® is a registered trademark of Honda Motor Co., Ltd.